Martha joined PrimeCare in the Tampa office in 2008. She received her education attending business classes at Harrisburg Community College in Pennsylvania. She holds certifications in Quickbooks and Excel. She previously worked as Office Manager for a construction company for 3 years in Myerstown, Pennsylvania and Receptionist for 6 years at the Calvary Baptist Church in Fruitland Park, Florida. 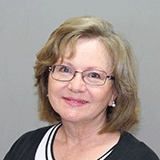 Martha is an Administrative Assistant in the Spring Hill office.